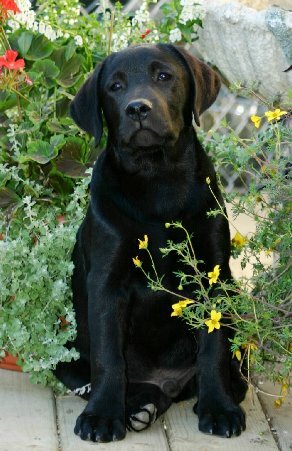 We really love our Labradors! We enjoy their wonderful personalities and the people we have met while owning and exhibiting them-in all disciplines. In order to have a new dog to show, we have the occasional litter of puppies. Puppies are a lot of work and should never be bought as an unexpected gift or on a whim. Below is an outline about what how Nyroca presents their puppies. All Nyroca puppies are born in our house and raised with lots of TLC. They are well socialized, happy and healthy when they leave for new homes about 8 weeks of age. We are an active household and even the children, teenagers + help give lots of extra love and affection. Lab puppies leave with their first set of shots, dewclaws removed, dewormed, a pedigree and a replacement guarantee for hips/elbows and eyes. Nyroca puppies are registered with the Canadian Kennel Club and are put on Non-Breeding Contracts. Breeding stock is properly screened and cleared of hip dysplasia, elbow dysplasia, ACVO eye cleared, Optigen and EIC tested. We have a litter currently on the ground, ready to go Dec 8/18. Black Males ONLY. REMEMBER, A DOG IS FOR LIFE!